Surrounded by mist some 3,000ft up in the hills of Sri Lanka and looking out from her mother’s shop window, teenager Amu* dreams of travelling to Colombo to do a science degree. She studies into the wee hours and wakes up early to revise her notes. She smiles as her eyes follow a group of women with tarpaulin bags slung on their backs. “We had some help to open our shop,” she tells me. “My father isn’t with us. My mother doesn’t have to worry about working the fields, we moved here for business. Most people here aren’t that fortunate.” She invites me in for a cup of tea, the sweetest I have ever tried. Around the world, tea is the most consumed beverage after water and in the late 1800s, tea became the most popular drink in Britain. However, while Britain controlled nearly a fifth of the world’s land, they weren’t in control of the production of tea, which was produced solely in China. In Sarah Rose’s For All the Tea In China, she describes Britain’s efforts to control the tea market as the “greatest single act of corporate espionage in history”. Before the Scottish botanist and notable tea thief Robert Fortune smuggled tea plants from China to India, a British colony, Britain had been trading opium for tea. This didn’t last long, as the Chinese Emperor soon took issue with managing a growing “nation of drug addicts”. After China, the world’s largest exporters of tea are now Sri Lanka, Kenya and India, where tea plantations were developed by British colonialists to build and serve the Empire. Sri Lanka’s tea industry is valued at US$ 1.5 billion, accounting for 17% of Sri Lanka’s total exports, and is responsible for 19.3% of tea exports. Yet, tea plantation workers are one of the most impoverished groups in the working classes. Many families are malnourished and lack the required funds to even leave the plantations to look for work elsewhere. 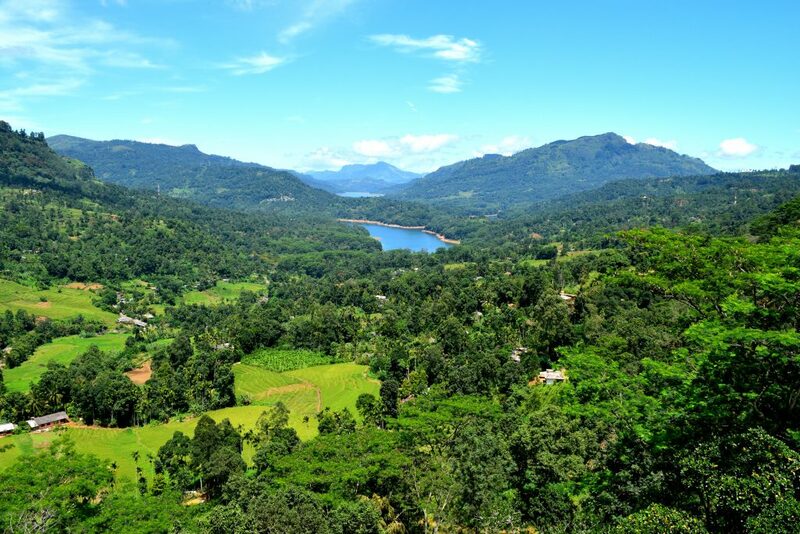 For the past four summers since 2015, I have driven up the winding roads which track through the hill country of Sri Lanka. One would think I’d be used to the heights and the cascading spectacle, yet both always catch me by surprise. Every year the sights appear ever more stunning, and each turn makes my head spin. Through my work with a charity called Capokolam, this year I am meeting with a young group of leaders from the Eastern Province. The charity’s summer arts education programmes for psycho-social rehabilitation gives me the opportunity to work with children and young people across the island. It is a privilege to learn about exchange and collaboration between these communities. Swetha* has daring eyes. She is 13 years old and has participated in our programmes for two years. She swings her backpack, donated by a group of doctors in the northern Sri Lankan city of Jaffna and says, “I want to be a politician so I can fix these old houses, but I need new Batas first.” Her Bata slippers cover only half her feet. Swetha’s mother, father and two siblings live with her father’s parents. Her grandmother visits the local temple up the hills in the morning before walking around the estate. “If I stay at home I’ll go crazy, and I’m not like that. I love dancing,” says her grandmother. Her hands are calloused from a life of picking tea, and her back somewhat bent. 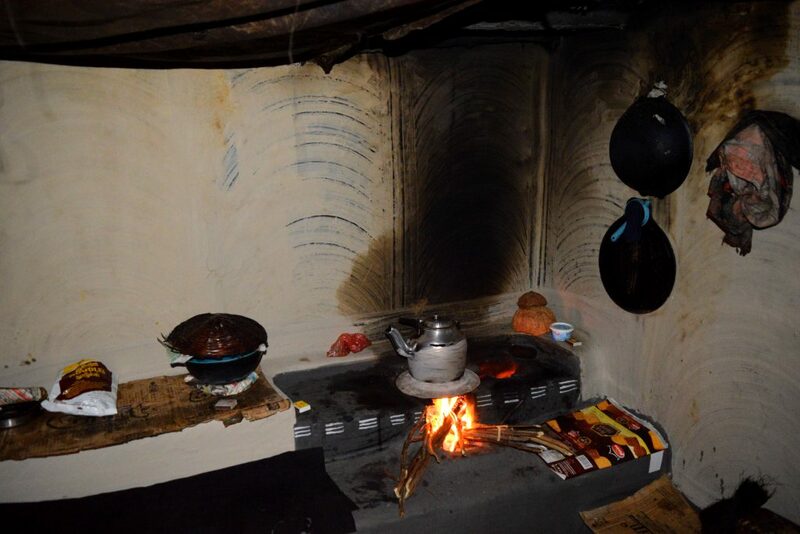 The family live in a two-room, 6 x 4 m house, sharing a toilet and kitchen space with the other families in the line house (where plantation workers live), with no access to running water. It was where Swetha’s great, great, great grandparents lived when the British took them from their native land in South India for a life working on the plantations. Swetha’s teachers have noticed a change in her attitude over time. For a while, her charming manner disappeared, and her already thin frame became skeleton-like. Rohaan*, a community leader, looked into what was happening at home. Her parents had said she was possessed by demons. Rohaan’s team advised she have a medical appointment, where it was discovered she had been sexually assaulted by her grandfather while her grandmother took her long daily walks and her parents were working in the fields. “Sometimes I don’t go to school, how can I? If you want biscuits you have to work for them,” says Jaynthan*, a boy I don’t recognise from previous visits as he had been helping his mother in the fields. 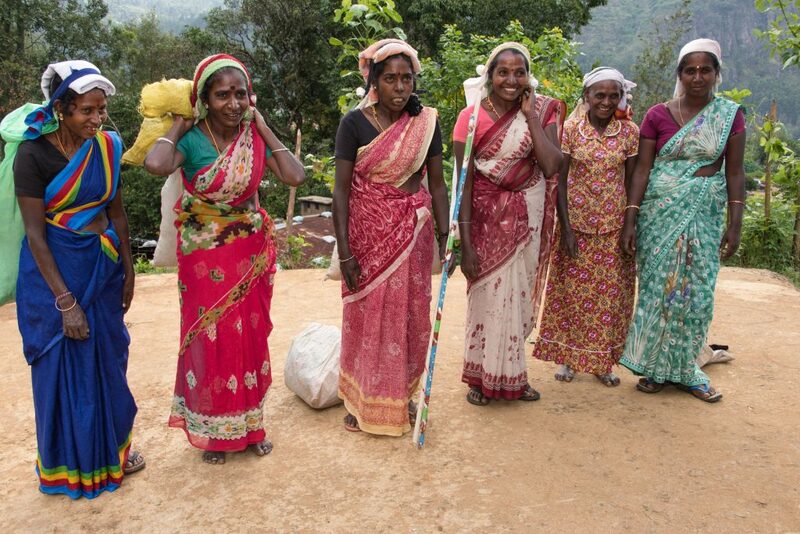 In Sri Lanka, women must pluck 18 kg of tea a day in order to make a daily wage of around £3.80. If the daily quota is not reached, the rate is £2.30. There are not always enough tea leaves to pick, and specific days must be worked consecutively in order to receive payment. Jaynthan’s mother had endured leech bites after rainy weather. “As long as I don’t see a snake, I can manage. But who should have to work like this?” she says. “Do you notice anything unusual?” Rohaan asks as we walk through a village estate. On the tourist track, the coloured houses freckle the landscape like sprinkles on a cake. But up close the colours are not as bright. The smell of urine and faeces wafts through the air, mixed with the earth and lush flora that cascades hill to hill. Rohaan points to an open window where the colourful images of Tamil cinema flash on a small television, the beats of a song reverberating out into the air. “There are many young people who no longer want to carry on the tradition of tea cultivation. Many are leaving to work in sweatshops in the city where they are also exploited. Through increased communication workshops, people are learning about their oppression. And this is how the corporations handle the change rather than making any actual improvements to living conditions or welfare”. It is bizarre a village that was only given access to regular electricity four years ago is now equipped with satellite dishes. Isolated in the clouds with little access to other communities and a lack of accessibility altogether, it seems like the television has become a distraction, as it can be in many households, preventing communities from questioning and organising for change, and instead of contributing to a sense of complacency and short-term satisfaction. Ironically, as we were discussing this, a man stumbles up the muddy hill, the scent of alcohol thick in the air as he tries to hide the large bottle he holds behind his back. It is a familiar scene I frequently notice on this estate driving up the hill to the village. It isn’t hard to miss the line of men waiting outside the relatively new liquor shop, lingering opposite where young people meet for after-school activities. The “shop”, which is more of a stand, offers cheap liquor to the community on credit. Every few months, customers are landed with a hefty bill which they, of course, cannot pay. The cycle of addiction, abuse and dependency creates great friction in homes and ultimately affects women and children. Women end up paying for their husbands’ alcoholism and abusive behaviour. During wet season there is less work, and men don’t work as much as the women in these communities, giving them more time to feed their alcoholism and rack up larger debts for women to pay. Shanthi* was 14 years old last year but appeared much younger. She has a tender smile. I meet her every year I visit the estate. She loved learning Capoeira and Bharatanatyam in our workshops. The way she quickly stuck to me made me wonder if she was dealing with some form of abandonment or abuse. The last time I saw Shanthi, she was in hospital after a swarm of bees from one of the many hives on the eucalyptus trees attacked children en route to the local school. Shanthi was in a hospital bed braiding strands of grass into bracelets. “For you,” she said, while tying it around my wrist. Rohaan and I speak about her often; he had noticed there was something peculiar about her home life. Bruises on her skin spoke of experiences she kept silent about, and her hugs around my waist grew tighter every year. Her mother had remarried due to financial burdens and debt, leaving Shanthi with her ex-husband, Shanthi’s father. In some poorer communities in Sri Lanka, when a woman with children is forced to remarry for economic reasons or to escape abuse, her new husband usually will not take on the “burden” of supporting her children. 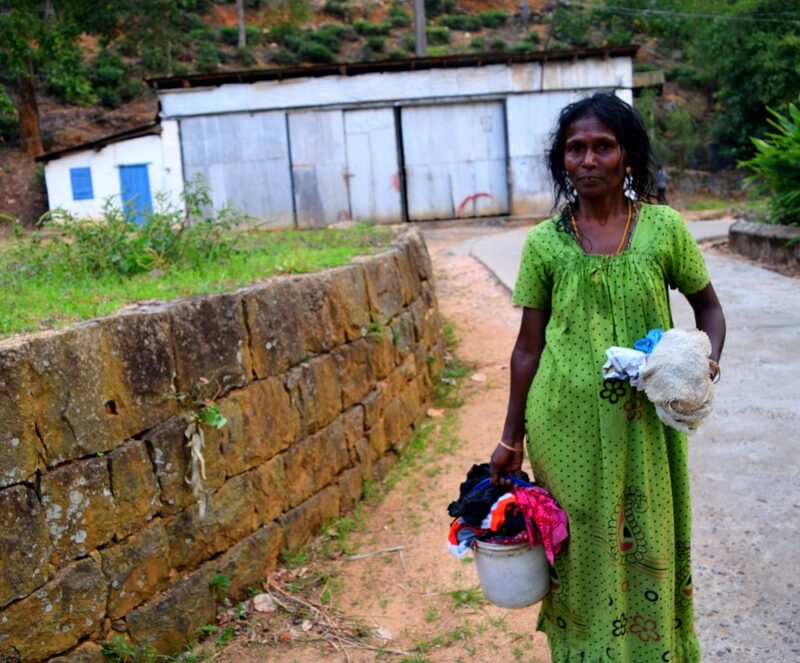 Many children are abandoned or, as in Shanthi’s case, left with the ex-husband and his family. During my visit this year, Shanthi is nowhere to be seen. Rohaan informs me that earlier in the year, Shanthi wasn’t attending her school classes, so he and the school’s headteacher visited Shanthi’s home and contacted the authorities. It was discovered that Shanthi had been trafficked as a domestic servant by her father, a common way for many families on the tea plantations to sustain themselves financially. As I sit drinking tea with Amu, I can’t help but wonder how many other stories like these there were hidden between sips. The bitter aftertaste stays in my mouth. With thanks to Rohaan Rajan of CACM, the local community, and the Capokolam Team. All names have been anonymised to protect the identity of those involved.